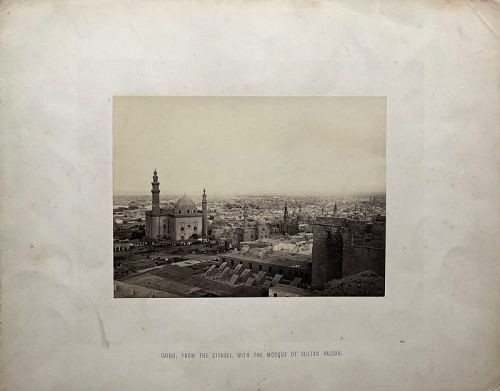 An albumen photograph of Cairo titled on the mat, “CAIRO, FORM THE CITADEL,WITH THE MOSQUE OF SULTAN HASSAN.” Also in smaller type the number648. An excellent print with good tones. 5 7/8 by 8 1/8 inches (15 by20.5cm). The white light cardboard stock is shaded slightly darker for about one inch around the photo. Overall size is 12 inches by 15 inches (30.5 by 38 cm). 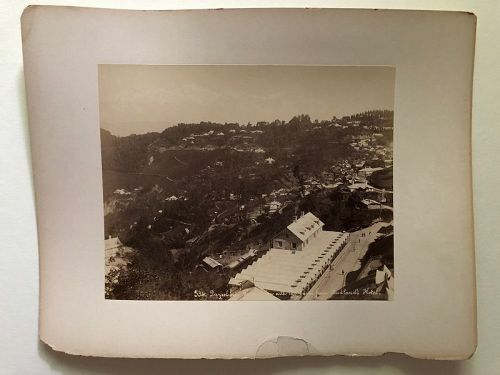 A landscape albumen photograph of Darjeeling India. Titled in script in the negative, “534. Darjeeling. General view with the Snows(?) from Woodland’s Hotel.” Presumably, “the Snows” are the snow-covered peaks of the Himalayas that show more as a line of clouds, but are visible in the distance. The details of the image are sharp at the center, but blur slightly at the edges. 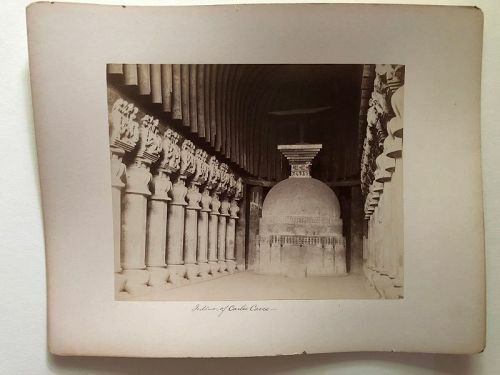 Albumen photograph mounted on a stiff card with the title, “Interior of Carlee Caves” written in ink below the image. The Karla Caves are a group of ancient Indian Buddhist rock-cut caves located in Karli near Lonavala, Maharashtra. The one pictured is the Great Chaitya. It was dedicated in 120 CE. The photographer of this image is unknown. 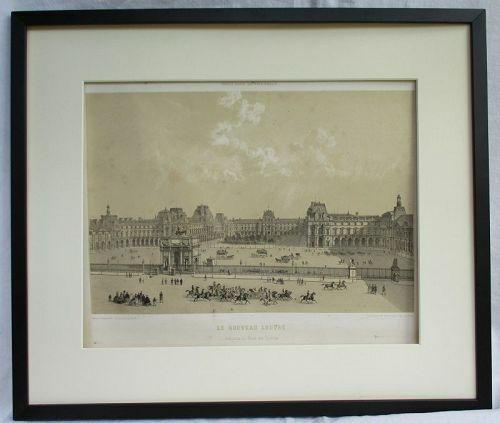 The image is 7 ½ x 9 3/8 inches (19 x 24 cm) The card is 11 x 14 inches (28 35.5 cm). 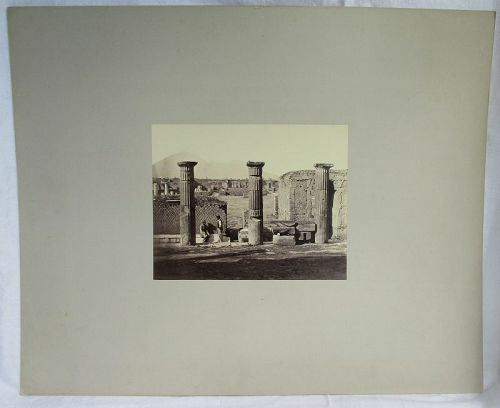 Albumen of three large columns and a couple of men in front of a large forum (?) with Mount Vesuvius in the distance mounted on grey stock. Excellent tones and sharp image. 7 38 inches tall and 9 ¼ inches wide (18.5 x 23.5 cm). Sheet 18 by 22 inches (46 x 56 cm). Condition; excellent with minor surface scuffing to the image. Card with some spots, rough edges and rounded corners, but overall clean. 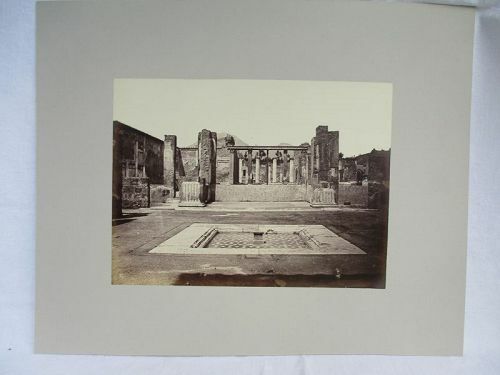 Albumen photograph mounted on grey stock of a shallow pool in the foreground the ruins of some walls and columns in the middle and Vesuvius in the distance. 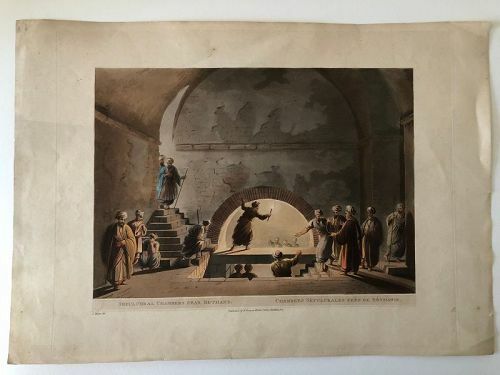 A very well printed image with deep contrasts in tones. The image is from around 1875. 7 9/16 tall by 10 3/16 inches (19.5 x 26 cm). Card 13 by 16 inches (33 x 40.5 cm). Condition; Generally excellent with a few surface scratches. 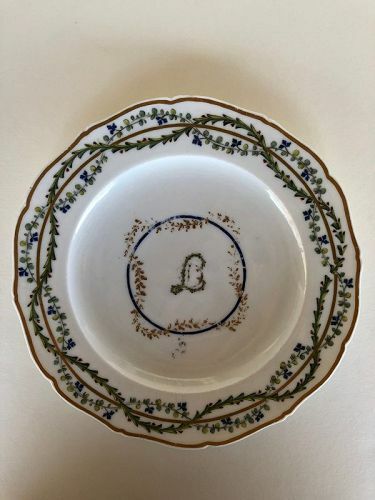 The plate had a few losses that were colored in before printing. 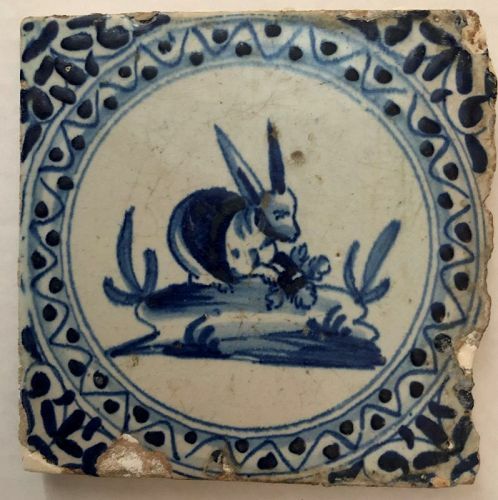 A Dutch Delft blue and white wall tile hand painted with a rabbit seated and eating. The animal is surrounded by a circle of a wavy line with dots in the wave troughs. Flowers fill the corners. It is 5 1/8 inches (13 cm) square about ½ inch (1.2 cm) tall. The red clay sides are beveled so that the back is slightly smaller than the front. This style of decoration was used in the 2nd quarter of the 17th century. 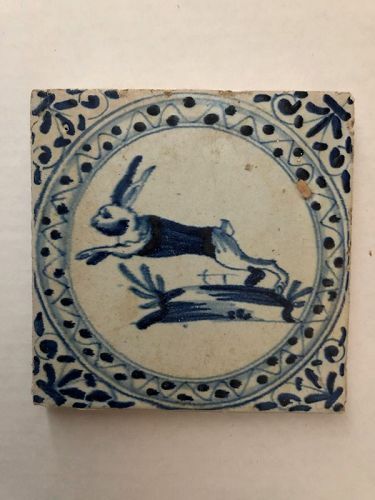 A Dutch Delft hand painted wall tile depicting a rabbit pushing off on its hind legs in motion to the left with its ears and tail high. The animal is surrounded by a circle of a wavy line with dots in the wave troughs. Flowers fill the corners. It is 5 1/8 inches (13 cm) square about ½ inch (1.2 cm) tall. The red clay sides are beveled so that the back is slightly smaller than the front. This style of decoration was used in the 2nd quarter of the 17th century. 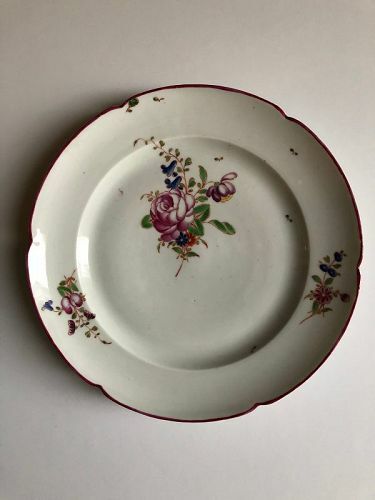 Pair of plates with a slightly scalloped body decorated with blue transfer printed outer border of small four petal flowers enclosing a wide border of scrolling flowers and in the center of the plate the outer border repeated around a sprig of similar flowers. Heavy pottery with printed mongram, impressed triangle and date letters J and K for 1888 and 1889. 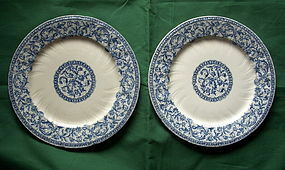 10 ¼ inch (26 cm.) diameter. 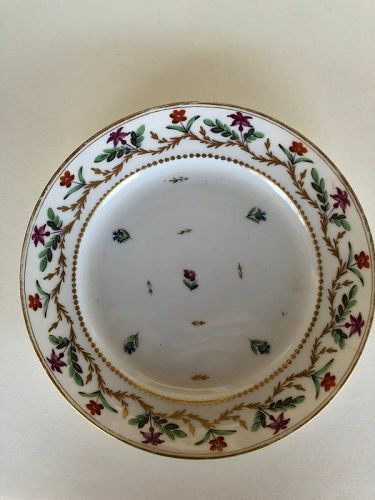 A Furstenberg hard paste porcelain cup and saucer decorated with bands and sprigs of sepia and black flowers with gilt rims and highlights. 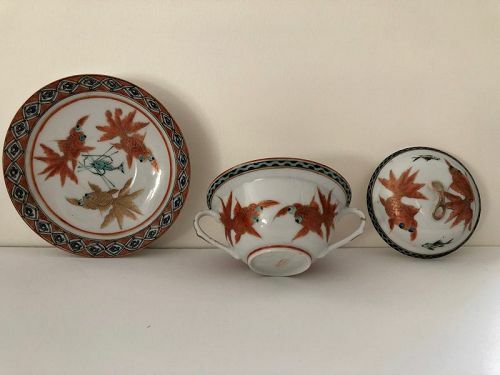 Both pieces are marked with an underglaze script F and a number (9). 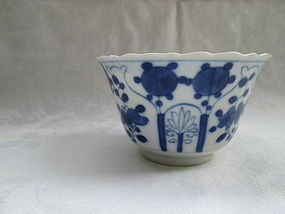 The arched handle is typical of early 19th century tea wares. The style continued in the middle of the century, though this style of sepia decoration is more usual in the earlier part of the century. 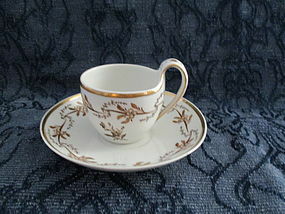 Saucer 5 ½ inches (14 cm) diameter, cup 2 ¾ inches (7 cm) tall. 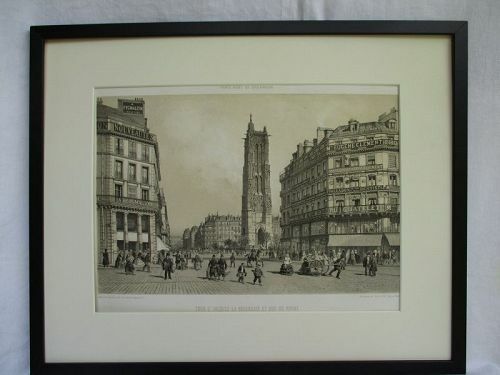 From the set of lithographs, Paris dans sa Splenour, published in 1861, this one is titled, “TOUR St. JAQUES – LA BOUCHERIE ET RUE DE RIVOLIE.” The printer and lithographer are shown in details of the lower left and right corners. The image without printing is 9 1/4 by 14 1/8 inches (23.5 x 36 cm), the page 12 ¾ by 18 ½ inches (32.5 x 47 cm). Condition: some staining, roughness around the margins and some rubbing of the surface. Matted and backed with acid free matboard. 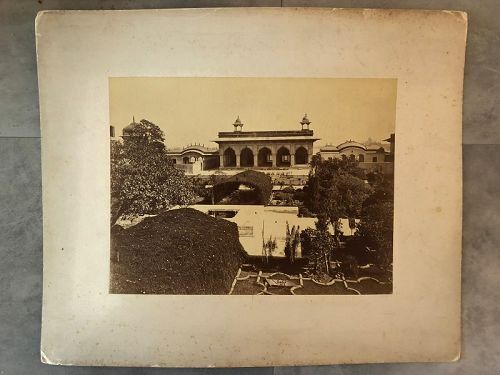 An albumen photograph of the Kas Mahal in the center and portion of the Anguri Bagh in the foreground. This view is of part of the Agra Fort. I’m not sure but I think the Taj Mahal is just visible on the far right above the roof of the building. The image is 8 3/4 (22 cm) by 11 ½ (29 cm) inches. The card is 14 (35.5 cm) by 17 (43 cm) inches. The image is signed in the negative “Sache/215.” John Edward Sache was active from 1865 to 1882.